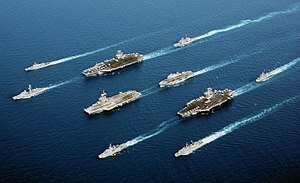 A rare occurrence of a 5 country multinational fleet, during Operation Enduring Freedom in the Oman Sea. In four descending columns, from left to right: ITS Maestrale , De Grasse ; USS John C. Stennis , Charles De Gaulle , Surcouf ; USS Port Royal , HMS Ocean , USS John F. Kennedy , HNLMS Van Amstel ; and ITS Luigi Durand de la Penne . A navy is the branch of a nation's military forces principally designated for naval warfare and amphibious warfare; namely, lake- or ocean-borne combat operations and related functions. It includes anything conducted by surface ships, amphibious ships, submarines, and seaborne aviation, as well as ancillary support, communications, training, and other fields; recent developments have included space related operations. The strategic offensive role of a navy is projection of force into areas beyond a country's shores . The strategic defensive purpose of a navy is to frustrate seaborne projection-of-force by enemies. The strategic task of the navy also may incorporate nuclear deterrence by use of nuclear missiles.